World indoor 1500m champion Abeba Aregawi has been provisionally suspended after testing positive for a banned substance. The Ethiopia-born Swede, 25, failed an out-of-competition test conducted by governing body the IAAF. 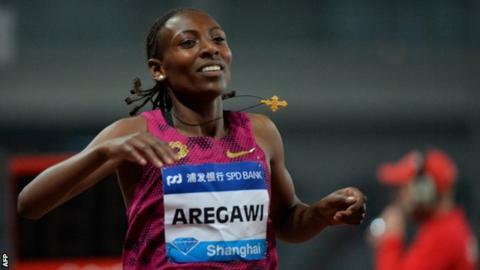 Aregawi, who won gold at the 2013 World Championships in Moscow and 2014 World Indoor Championships in Sopot, has requested a B sample be tested. Britain's Hannah England finished fourth behind Aregawi in Moscow. There is no suggestion Aregawi's performance in that race is under scrutiny. Aregawi ran for Ethiopia at the 2012 London Olympics but began competing for Sweden later that year after being granted citizenship. She was due to defend her title at next month's World Indoor Championships in Portland, Oregon. Her suspension also means her place in the Swedish team for the Rio Olympics in August is in doubt. The Swedish Olympic Committee (SOC) has already withdrawn its financial support for Aregawi. "The situation regarding her place on the Olympic team is in quarantine as we wait for the result of the B test," added SOC chief executive Peter Reinebo. Her Dutch manager, Jos Hermens, told the Expressen newspaper that the news had come as a surprise. "We can't understand it," he said. "We are trying to work out what has happened. It's very strange." But Sweden's athletics chief has been pretty scathing. "It is with dismay and extreme disappointment we have to make this statement," said Stefan Olsson. "We are totally opposed to all forms of cheating, doping and illicit substances. We have zero tolerance and this is totally unacceptable." American Jenny Simpson, who was second behind Aregawi at the 2013 World Championships, expressed her "grief" at the news. In a statement to the New York Times, she wrote: "I'm grateful that the sport is taking steps to catch cheaters and meaningfully deter others from violating the rules in the future. "Justice begins when someone that stole from the sport isn't going to just get away with it. But I grieve the decision that was made by a skilled athlete, capable of greatness, to take a shortcut." She added: "I'm hopeful that things might really be changing for the better in our sport and I'm sad it didn't start changing sooner." It has not been a very good few days for Aregawi. She has been caught up in a tax row in Sweden after telling authorities she had never lived in the country and therefore was not liable for tax. She was ordered to pay 11,112 Swedish crowns (£932, $1,299) in back taxes. Read more on Should 'Blade Jumper' Markus Rehm be allowed in the Olympics?